It's tough work, but pullups yield big benefits. As a woman you'll probably never get the poppin' biceps that your man might have -- but you certainly don't need to live with the flabby arms that befall his grandma. 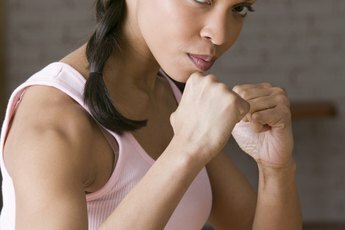 In order to tone the front and insides of your arms, focus on strength-training exercises a few days a week. Surprisingly, the exercises may be more "back to basics" than you might think. Do varying types of dumbbell curls. You probably already know how to do the standard bicep curl, holding the dumbbells and starting with your palms facing forward, then lifting the dumbbells to shoulder height while keeping your upper arms stationary. To add in some variation -- necessary for preventing the muscle "boredom" that can prevent you from continuing to make gains -- try alternating between the standard dumbbell curl and the hammer curl -- facing your palms toward your thighs instead. Alternate between the two styles throughout the week; do two sets of 10 to 12 repetitions of the standard curl one day, take a 24- to 48-hour break, and then do two sets of the hammer curl. After another 24- to 48-hour break, go back to the standard curl. Master the chinup and pullup. Admittedly, you're probably not going to be able to knock out as many of these as your man can, but even doing a few repetitions is a great workout for your entire upper body, including your shoulders and brachialis -- a muscle on the inside of the upper arm. Alternate between chinups -- in which your palms face toward you -- and pullups -- in which your palms face outward. If you can't manage to do even one just yet, start with an assisted chinup machine that displaces some of your body weight, or find a chest- or waist-high horizontal bar and do them with your feet resting on the floor, keeping your arms about shoulder-width apart as you pull your body upward and work to lift your chin to the bar. Aim for two sets of 10 to 12 repetitions, three days a week. If you can manage to do two full sets, more power to you, girl. Do variations of the pushup -- another great exercise for the entire upper body, including your shoulders, biceps, triceps and chest. If you can't do very many "real" pushups, do as many as you can and then switch to resting your knees on the floor to complete two sets of 10 to 15 repetitions. When you've mastered that, try doing them with your feet resting on an exercise or stability ball. Add even more variation into your routine by placing your arms on the stability ball and your feet on the floor. Alternate between all of these variations to do pushups three or four days a week, with 24 to 48 hours' rest in between. The exercises listed here will help you tone and strengthen your upper arms -- but if you want those lovely muscles to show, you need to do exercises that will help use up calories and burn off the fat that's surrounding those muscles. To get more bang for your buck, do cardiovascular exercise that burns a lot of calories in a short amount of time, such as running, swimming -- which will also build muscle in the arms -- or dance or aerobics classes that include a lot of arm movements.